My youngest daughter started using Ceelin when she's an infant as prescribed vitamins by her pediatrician. But before we were using CEELIN ---- This I am referring to with my eldest daughter, an experienced I will never forget in my entire life. Mikaela was born to be a happy and healthy baby girl, but when she reach the age 6 years old she always got sick and we often stayed in the hospital for almost half a year which cost us a lot of money for doctor consultation and for medicines. She was very active in school --- academically and non-academically, active with her co-curricular and extra curricular activities and she's always on the go, then without a clue her health deteriorate. Actually, this is an honest to goodness review of how CEELIN help us regain her weight and how she survived BRONCHOPNEUMONIA. As a mother, you will really ask yourself what happened to her health? Why and where she got this kind of sickness? We commute from home to school, dealing with high level pollutants that causing a serious global environmental problems like climate change and ozone depletion. The guide of poor air quality from going back and forth from school and in going home and in dealing community surrounding really affect her personal growth and health. At her very young age, things that surrounds her give her that kind of sickness that greatly affect her studies, I thought she can't graduate from Kinder. But thanks so much to CEELIN, because of this product she regain her strength and bring back her normal breathing with the new scent of life. When my daughter started taking CEELIN, I have noticed that she can't easily got sick compared before, and if she got cough and flu she can easily recover within 2 to 3 days. We all know, VIRUSES and DISEASES are stronger and more aggressive. Because of changing times, immunity is the top most priority and non-negotiable health benefit for our children. But how we can get that full protection without affecting our budget? ANG MGA SAKIT MADALING MAKAHAWA, MABILIS LUMALA, MAS NAGTATAGAL. I am more confident now using CEELIN as my SHIELD Vitamin Protection for my kids and it's less expensive compared with other food supplement. Now that I have two daughters, I continue using this product. Rest assured that my kids are well-protected against COUGH, FEVER and RUNNING NOSE especially this rainy season. I will not take any chances, changing my choice and make alternatives to find solutions to my problems. It's okay to give them healthy food, milk, biscuits and other fortified foods. But this are not enough to protect our children from deadly viruses and diseases. I got it and I resolved it with the help of CEELIN a product of UNILAB Philippines. My eldest daughter have CEELIN for almost 9 years now. She is 15 years old. CHELSEA the youngest, started using CEELIN when she's an infant and now she's 12 years old, and so thankful that I've never encountered such scenario I had with my eldest daughter. Both are young adults, and still they are taking CEELIN --- the CHEWABLE one. Great to know that there is another product from CEELIN. A more improved VITAMINS and MINERALS Food Supplement for Kids. With such great pride, honor and gratitude with this product, I wonder what made this VITAMIN so effective. It says that ASCORBIC ACID CEELIN product increases BODY RESISTANCE TO INFECTION and STRESS, also a great maintenance for HEALTHY GUMS, CARTILAGES, TEETH, BLOOD VESSELS, CONNECTIVE & OSTEOID TISSUES. While ASCORBIC ACID ZINC CEELIN PLUS has another layer of protection, this time it has a FULL PROTECTION uses the unique ZINCPLUS TM Technology that combines Vitamin C and ZINC in a liquid format which result to a DUAL IMMUNITY BOOSTING ACTION and a more STRONGER IMMUNE SYSTEM. The Changing Times call for a superior protection from CEELIN PLUS. The VITAMIN C PLUS ZINC is for "PROTEKSYONG PLUS". 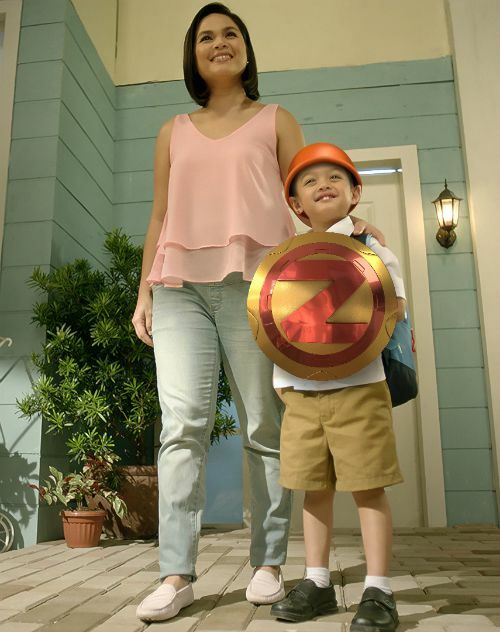 (2) SHIELD, which represent ZINC for the additional PLUS Protection. Attached herewith is a video, to tell us more what CEELIN PLUS can do to our children. PARA ANG SAKIT HINDI TUMALAB, HINDI LUMALA, HINDI TUMAGAL. This brand of vitamins has been tested through generations from my eldest to the youngest, there's nothing like a good vitamins to help supplement my kids needs. I trusted CEELIN for a years now and I don't have any regrets with this Ascorbic Acid supplement. Children now are very lucky to have CEELIN PLUS because they can get more full protection and a lot of a boost of energy to enjoy life without hesitation. And mother's like me will be more confident to let their children play, because they are assured enough that everything will be taken cared of with the help of CEELIN PLUS to their kids. I was a ceelin baby too! I would always wonder why my urine was orange, then the doctor would explain that it was because of ceelin, and we didn't have to worry. Anyhoo, I was a healthy kid because of Ceelin! Colds and flu are very much affluent these days due to the rainy season so it's better to prevent being sick than getting actually sick. My cousin is a Ceelin user and I must say that it's really effective. Always protect our kids from sickness / illness and have vitamins :) I always see to it that Ceelin is ready in the daily routine of my baby. My mom has been recommending us to take Ceelin before when we were kids and I remember we were also more immune to common diseases especially viral ones. Taking vitamins and supplements is always better than none at all. i also use ceelin for my 4yr old son. it's very effective. The kids also drink Ceelin everyday. Kudos to them for helping heal your daughter! And yep, we have to be extra careful during these times because the viruses really are more aggressive. Ceelin is a very popular vitamin for kids. I am glad that Zinc has been added to it because this element can be difficult to get from regular diet of kids. Zinc is essential mineral for oral health. Ceelin can really strengthen a kid's immune system. You can now be more confident when they stay outdoors. My nephews and niece are are using ceelin too. In these days where weather is unpredictable its very important to take vitamins especially for kids. With Ceelin, kids are protected even if they stay outdoors most of the time! never heard of this product before. don't think it's available in my country. but I do take quite a bit of supplements too, like vit c and b, collagen and probiotics. Every kid needs a good vitamins like Ceelin. Just as you said, times have changed. Children are more susceptible to illnesses so they need to be protected. I actually have not heard about this before but atleast after reading your post i am bit aware of it. Nowadays people are giving more vitamins to kids. Diseases is common now especially with the changing weather. It's nice that ceelin can raise a kid's immune system. Especially now that the flue season has kicked in, we should really protect the kids. Fever nowadays are really heavy in the body so we all needed added protection. eating the right supplements is very important, whether kinds or adults. A highly educational post! Never heard of this product! I was reading and wondering for the longest time what is Ceelin (sounds like someone's name) until the bottle came out! Glad that now you have found a product like Ceelin that can keep your children growing in a healthy way. My apo is a Ceelin baby. but me , Tiki-tiki lang. My kids rarely come down with the flu, they take natural organic supplements though which both my husband and I prefer. Also we take the healthy lifestyle pretty seriously. Prevention is always better than cure. I live in the city of our province. Things have changed now, I always smell the smoke from vehicles whenever I commute after work. We really need supplements and vitamins since we can't get it all from the foods that we eat. We need protection from different pollutants that is present in our world now.